I'm in the process of making some changes to my guest room. I love my guest room, and there are several things I didn't want to change. In particular I like the fact that some of the decor is French. I don't want to go overboard with Francophilia, but little bits and pieces make me happy. The colors, though, were asking for a little updating. The room has been decorated with red and gold for awhile now, and I've been wanting to add some green and blue to the mix. 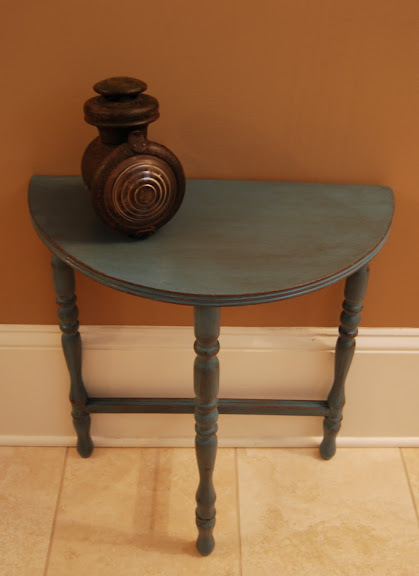 Finding inexpensive accessories that include the right color of blue, though, has been a bit of a challenge. 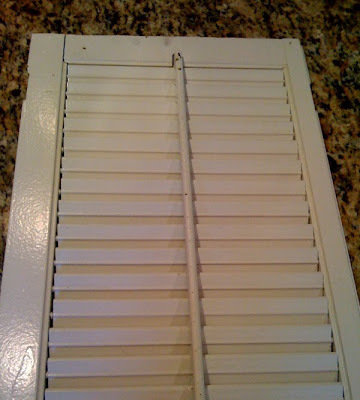 Then last week I saw a wonderful post about shutters at Good-bye House, Hello Home. Leslie inspired me to think about using shutters in my guest room. 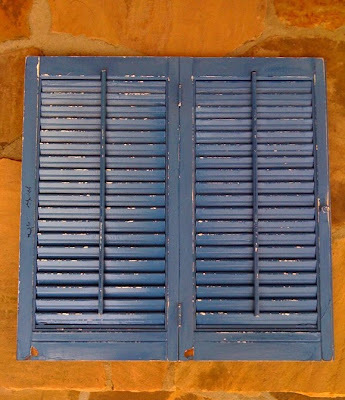 What I really wanted was a pair of shutters from a French cottage. 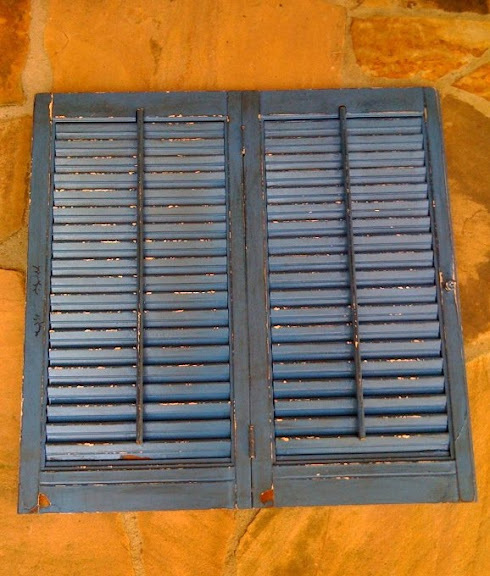 Old shutters. Blue shutters. I could just see the cottage with its old blue shutters in my mind's eye. 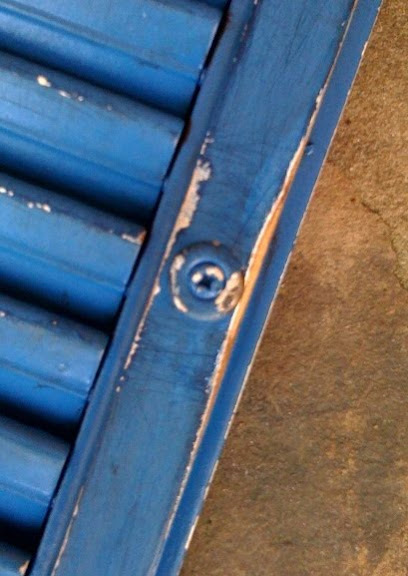 As you can see, the shutters were not blue or old. But that's okay, because I have experience with making things look old and blue. Remember my little table? Then after some sanding. . .
. . . and some wipe-on staining. . .
As I stood surveying my handiwork, my 17-year-old son walked up. "Where'd you get those?" he queried. "Those shutters look like they survived the Nazi occupation." Now to find the perfect postcards to tuck in the slats. What do you think? Update: Click here to see the guest room all finished! **I'm joining Sarah's Before and After Party, Debbie's Before and After Party and Frugal Friday at The Shabby Nest. Check out all the fun projects! And I'm linking to Weekend Bloggy Reading at Amanda's. There are always some fun links there--check it out! I absolutely cannot believe how cheaply you got those shutters. In the UK, they'd be really expensive, charity shop or no charity shop. Insane jealousy aside (who am I kidding?! I'll be fuming all evening!! 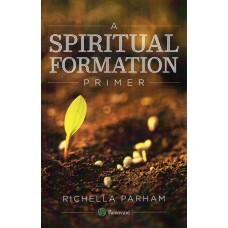 ), you have completely transformed them. I'm beyond impressed (again!). Richella they turned out great!!! I think by your sons response that tells you they turned out perfect. I love the old rustic beat up look. You did a great job. Thanks for joining me today. Richella, they are GORGEOUS! I've been wanting to get some shutters for my mantle. I haven't checked my HFH store lately. I might need to recheck there. Lovely!! I've got to get some shutters....heading to St. Vinney's today and maybe I'll get lucky. I would have replied, "That's the look I was going for!" I have some French Postcards for you, if you like--really! REAL ones (Printed in France and everything!)! They have reds and blues and golds and reds in them, they are about 8"-10" X 5-6". I would love you to have them if you like them. See this post and look at the cards on the iron scrolly thing behind the cabinet. I wish I had your gift of distressing and faux painting! So happy to have inspired you--this is what blog friends do. You inspire me, too! 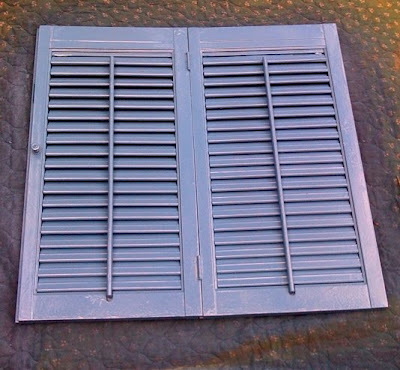 Your shutters are awesome! It's amazing what some paint & love will do. Kind of makes me sorry for not buying the shutters I spotted at an estate sale this summer. I love how your shutter turned out. Those really do look old. Great job and I can't wait to see the finished room. You got the skillz, girl! They look awesome. Did you tell your son "why, you smart thing, they did survive the Nazi invasion...in France! A success for sure. They'll look great with the cards and photos you find for them. You did a great job! Hurray for you for accomplishing exactly what you wanted! And what a great deal. I love it! I can't believe that you bought those for 3 dollars! What a great find and they look fabulous! I love that look and your son is quite funny! Your son put it best! They turned out great! I love the color. I have some smaller ones stashed in the garage I might dig out. Thanks for the idea. From one Francophile to another, tres magnifique!